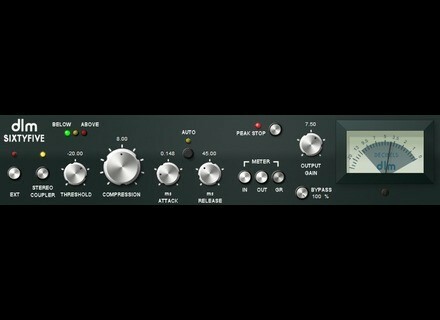 SixtyFive, Software compressor from De La Mancha. de la Mancha has released sixtyfive, a vintage-style, RMS Compressor, inspired by the dbx 165A, a classic 1970s compressor found in many studios, but it also adds a couple of new twists. It's described as a soft-knee RMS compressor with a vintage flavour. The RMS detection and soft-knee is designed to help give a smooth and musical compression experience, the non-linear response imparts character and the gentle saturation brings colour and warmth. As well as all of the originals features, this version adds parallel compression, extended knob ranges and peak metering. Vintage style RMS compressors with non-linear response, parallel compression and comprehensive metering. Colouring from a unique blend of harmonics, saturation and noise. Wet/Dry control allows blending of dry uncompressed signal for phase-free NY style parallel compression. Auto attack/release with manual option. Manual attack/release has ultra-low values. Linked Stereo input detection, can be unlinked. LED display to indicate above and below threshold, and in the knee. sixtyfive costs $15 and is available for Windows as a VST effect plug-in. Wave Alchemy Summer Sale Wave Alchemy announce a summer samples sale with up to 15% off. IK Multimedia AmpliTube iRig IK Multimedia announce AmpliTube iRig: the mobile guitar amp and effects rig system for iPhone/iPod Touch/iPad. Loopmasters Drumdrops in Ska Within this Ska Drumloop collection you will find about 750Mb of 24 Bit samples presented as a collection of 172 loops, which cover speeds from 117 through 132 Bpm, with main loops, variations, fills and transitions.